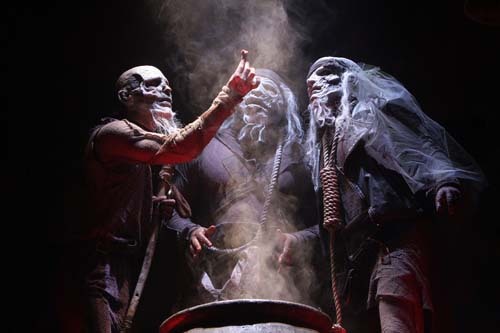 Double, double, toil and trouble / Fire burn and cauldron bubble.: The Weird Sisters (Andrew Zox, Cleo House, Jr., and Eric Hissom) in Macbeth at Folger Theatre (2008). Folger Shakespeare Library. If you are a fan of Folger Education, you are well aware of the focus on performance-based teaching and how getting kids up on their feet is an effective way to understand and appreciate Shakespeare’s plays. Analyze multiple interpretations of a story, drama, or poem (e.g., recorded or live production…), evaluating how each version interprets the source text. The clips I mostly use are from the Folger 2008 production and the Polanski 1971 film. For certain scenes I might use the 2006 Australian version, the 2010 BBC version starring Patrick Stewart, or the 1948 Orson Welles film. On video analysis days, my class uses Michael LoMonico’s video expert sheet. I break the students up into four or five groups. Each group has five individual jobs, and each student in the group will do their task while watching the film clips. The screenwriters follow the text and write notes about which lines were omitted or rearranged. The sound editors are not allowed to watch the clip. They must have their backs to the screen and write down sounds they hear. Examples would be natural background sounds like a dog barking or the wind blowing. They also observe what the music tells us about what may be taking place on the screen. The set and costume designers pay attention to the location, costumes, and props. This is always fun to talk about during the opening witch scene in Macbeth or the banquet scene where Banquo’s ghost appears. The last group are the actors who concentrate on an actor’s performance paying close attention to accents, tone, subtext, and emphasis on certain words or lines. As the screenwriter I began the scene with the witches stating their last words of the scene, “Fair is foul and foul is fair.” I thought it would be a dramatic way to begin the scene. Then I had the first witch say the first line of the original text, “When shall we three meet again?” You may have also noticed I cut out the lines about Graymalkin and Paddock. I didn’t feel the need to have a ghostly cat or toad in the scene. Another thing you may have noticed is that I only had two witches deliver the lines. The other witch was a mute. After the student shares and defends “his” or “her” choices, I would let any audience member make comments before moving on to the cinematographer, the sound editors, and so forth. Having enough clip viewings in two weeks assures that each group will present throughout the unit. Here is where the students teach the teacher. It is amazing how many instances in which the students notice something I’ve never picked up on. The students enjoy seeing the different scenes and then critiquing who made Macbeth the most interesting or why a director made certain choices. Sometimes, students will start complaining about the way the actor delivered a specific line or why it was awful to leave that specific line out of the production. There is strong authentic learning going on during this activity. If you feel guilty about showing too many film clips in the classroom, then I will leave you with this: Shakespeare was meant to be seen—not read out of a book. If you’re concerned students aren’t experiencing the language, then put the subtitles on. I watch almost all of the clips with the subtitles on so they can see the words and I can pause on a line to talk about it in more detail. Chris Lavold teaches high school English and coaches varsity baseball in Mauston, WI. He is a member of the Folger Teachers Corp and can be reached at chris.lavold@gmail.com or clavold@maustonschools.org. You can also follow him on Twitter @shakehitch. Yeah, really good idea Chris! Thanks for sharing. I wonder—has the dagger scene, in particular, provided some pretty interesting analysis for your students? I know the presentation of this scene is notably different in Polanski’s version, Sir Patrick Stewart’s version, and Orson Welles’ version. Also, how do assessments work for this assignment? Do you grade your students by how well they come up with a reasonable argument for the presentation? Thanks for sharing, Zachary. Great questions. Let’s chat over Twitter! Chris Lavold is at @shakehitch and we’re at @FolgerED.